Cacheman is an application designed to improve the performance of your computer by optimizing several caches, managing RAM and fine tuning a number of system settings. Auto-Optimization makes it suitable for novice and intermediate users yet it is also powerful and versatile enough for computer experts. Backups of settings ensure that all user modifications can be reversed with a single click. Cacheman runs on Windows XP/Vista/7 x86|x64. Cacheman is separated into three major components. 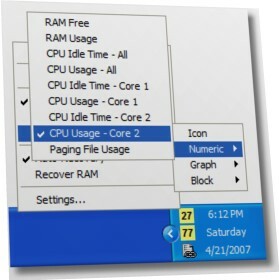 The system service (CachemanServ.exe), the Tray Icons (CachemanTray.exe) (configurable in the Options tab of the settings window) and the settings application (CachemanControl.exe). The system service uses minimal resources (usually less than 2 MByte) and virtually no CPU time. You need administrator rights to setup and configure Cacheman. After this process is completed, every user on the system can utilize both the service and the tray application. The Tray Icon options can be set according to personal preference by every user. If you double click the Tray Icon or launch Cacheman for the first time, the Cacheman settings window (Cacheman Control) will be displayed. The settings window includes a Toolbar and eight tabs where you can configure Cacheman and fine tune several system settings. Cacheman has created a backup of all your system settings on first program start, so you can always revert to the original state if you are not satisfied with the results.